Robert Cromwell practices in the firm’s Financial Services and Corporate Groups. Mr. Cromwell’s practice is focused on purchases, sales and recapitalizations of private companies, venture capital start-ups, private equity transactions, registered and unregistered investment companies (ETFs, private equity funds, real estate funds and hedge funds) and representing founders, managers and boards of businesses and investment funds. Mr. Cromwell also advises clients on general corporate matters. Mr. Cromwell’s transactional experience includes: corporate and LLC startups, restructurings and exits; registered and private securities offerings; hedge funds, mutual funds, private equity funds, collective trust funds, CLOs and CDOs; marketing investment funds and investment management services in the U.S., Europe and the Far East; preparation of corporate and partnership governing documents, registration statements and periodic financial reports, equity incentive plans, loan agreements, ISDA swap agreements. Registered fund experience includes registration statements and exemptive orders for ETFs, U.S. open-end and closed-end funds and unit investment trusts. Also, counseling boards of directors of registered and private funds and retirement plan committees. 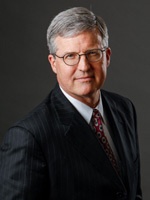 Prior to joining Sadis & Goldberg, Mr. Cromwell was Senior Counsel at Marino Partners as well as functioned as Chief Legal Officer to registered investment adviser subsidiaries of multi-national public companies, Nomura and KBW, and prior to that functioned as legal counsel to a registered investment adviser subsidiary and a trust company subsidiary of General Motors. Mr. Cromwell commenced his legal career as an associate with the law firms Shearman & Sterling and Brown & Wood.